You may have noticed how much I like to start projects, lol. I love finishing them even more!! Soft and warm. 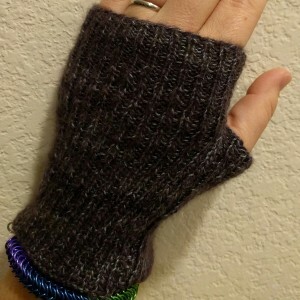 <3 I knit the second mitt flat and single crocheted up the side to seam it. I can’t even tell when they’re on. 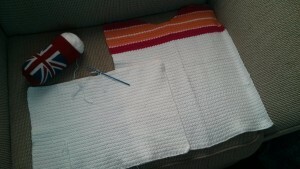 I frogged two more projects too. One was Second Story from an Interweave Knits magazine, it just wasn’t coming out right. Oh well. 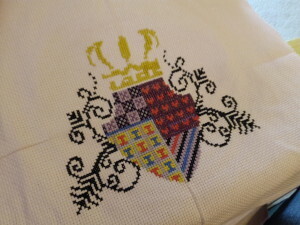 The other was my square doily, the tatting is really uneven and sloppy… So I didn’t frog it but I put it away. Same with the shamrock! Ugh! That’s okay. It feels good to finish things, even if they didn’t turn out the way I planned. 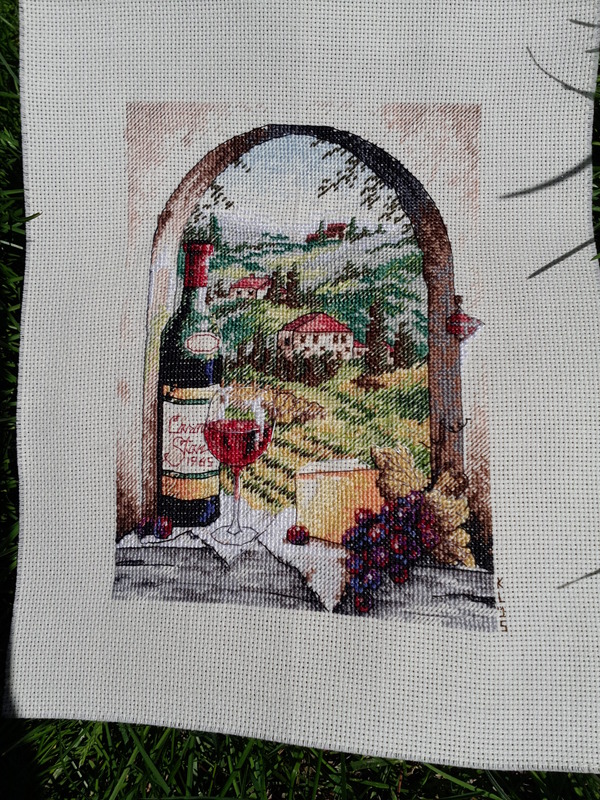 Have you finished anything lately? Having lots of hobbies is fun when I feel like doing “something else”, I can just reach for something else! I’ve been nuts for the hook again lately. 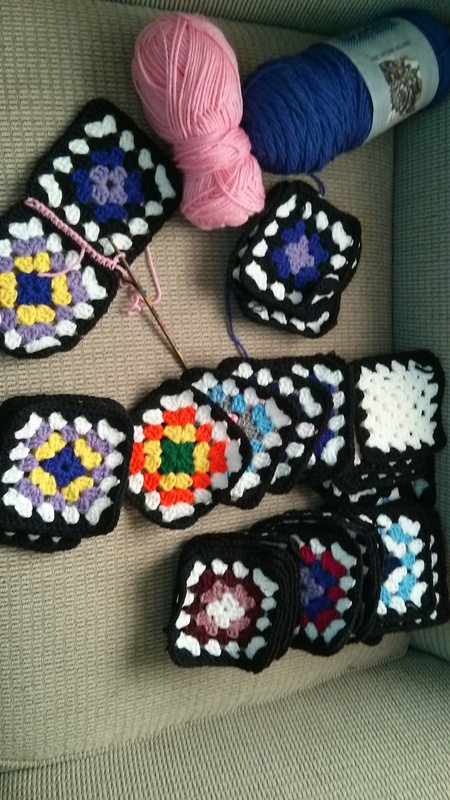 I organized and found a good way to connect some granny squares a friend gave me. They were her mother’s and she gave these to me after her mom passed away, along with a bunch of hooks and needles. It means a lot, hard to describe how much, that she gave me those. Projects, tools, yarn that have been passed on in some way mean a lot to a crafter. I can continue where she left off and add my own spin to it. I’m trying to use what I have a lot more. I found this pink yarn in da stash and it looks cute. Love that wooden rainbow hook! 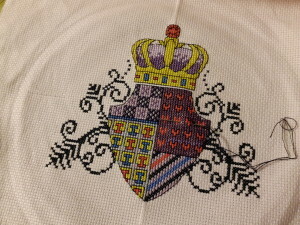 The purple would look very nice as a border. I punched out some gloves last month! They were so fun to make with the stripey stuff I found in my stash. Details here, as always. I finally finished Trillian and the Fortune’s Shawlette too! That shawl (and Moogly) are whom I blame for getting me crazy for crochet again. ;-) I found those gloves there, too. 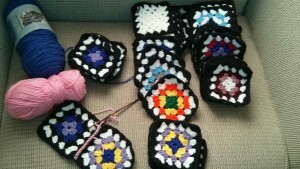 Remnants of sock yarn are lately going towards a sock yarn granny blanket. 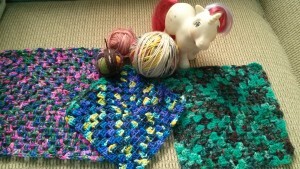 I’ve been using up the last bits of shawls and such into big granny squares. Eventually they might become a blanket. I’m thinking I might be the blanket mood come cold weather time. I have the Robot Overlord yarn from Fortune in the work truck. 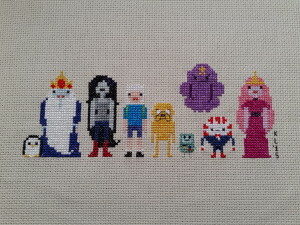 I stitch a little here and there. I had some adventures with my Juicy Top; I got the gumption to finish it once and for all! Then I ran out of yarn. You may know where this is going. It’s the same old story: I run out, I figure I can buy more (this is an old project remember), can’t find any, none online either, it is…DISCONTINUED. noooooooo!! Luckily the interwebs thought that might happen, and I found this site for suggestions on replacements. Seriously, I love you, internet. Knit Picks to the rescue! I got two more balls because I know better now. I get one more than I think I need anymore, because really, it’s not like it will go to waste, lol. 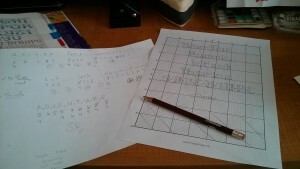 So here is my progress! The yarn is not exactly the same, of course, and if you were to look closely you would see that right away, but I don’t mind. I’ve come too far to give up on that shirt now! I’ll be sure to use my dressing dummy when I construct it so I’ll know it fits. I finished a cowl for my brother too! He asked for another scarf, and I made this. The yarn is perfectly named Zombie BBQ and he loves zombies. Finally, I started a nice long cowl for my friend. More stashbusting! I could write more but here’s the link to my project page. Today is International Crochet Day, so off I go! Hook on! A couple weeks ago, B suggested we clean out the office closet to make room for the linens. We have a metal shelf (from the big box store) that we have crammed with stuff, but was originally supposed to be for sheets, towels, etc. He had a great point that it was more a linen shelf lately than a linen closet, lol. So, I cleared out all of my crafty stuff except the sewing stuff (and I even went through all of that! whew!) and moved the crafty stuff to our closet, to live with the yarn. I found so many forgotten ideas, projects, supplies, you name it! 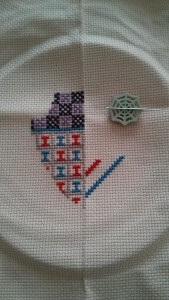 I even found some cross stitch patterns I forgot I had, as well as a whole box of extra floss. Like, I have so much floss I have extras of about 30 colors. 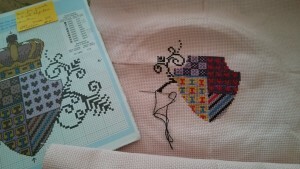 We haven’t gotten around to organizing the linens yet, but I jumped head first into some cross stitch projects. 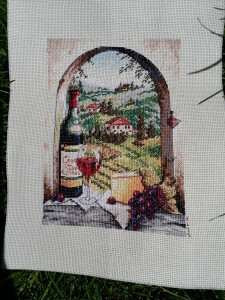 I finished Adventure Time (wee little stitches) for a friend, and even finally finished Dreaming of Tuscany for my aunt and uncle’s 50th anniversary. My folks will take that to them this week! woohoo! I’m so relieved to have it go to it’s recipient. 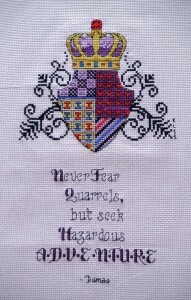 “Never fear quarrels, but seek hazardous adventures.” Cool! 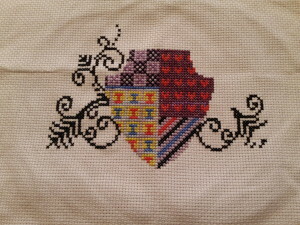 I can’t find a link to the pattern…so you’ll have to stay tuned! Oh, and that’s a needle minder/keeper I made. :-) I found a button and glued a strong magnet to the back. I’ll probably post more on how I did it another day, I’d love to make more of them. Penny gave me a pattern for a Doctor Who sampler and I plan on getting to that right after this post. I even ordered some gorgeous hand-dyed fabric from on etsy. Oh, man, it’s really something. I think I fixed all the too big pictures on the site plus I added tags to all the posts. I’m getting the hang of this. Well, off to the rest of my day. :-) More soon! Yup. Pox seems to have left us for the time being, whew! I’ve been pretty militant about washing hands around here, after I caught pink eye from the kids a few weeks ago. Blech!! 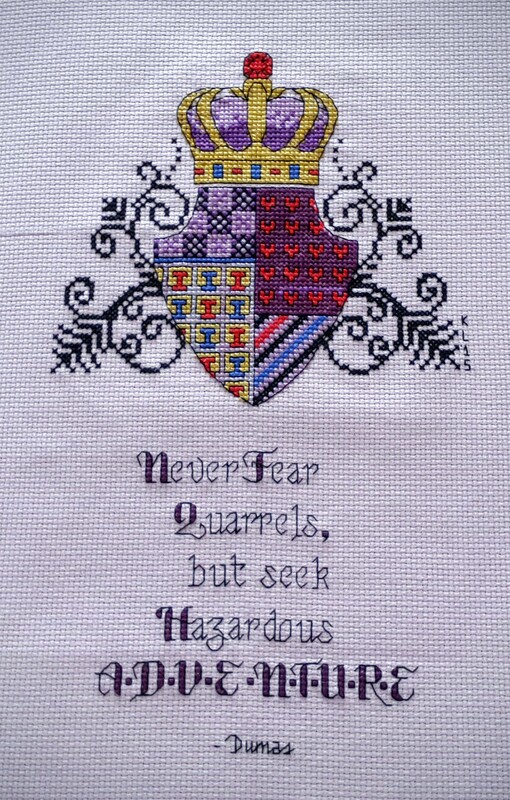 I’ve been stitching away, as per usual. I finished an old scarf, Cruella, and Sleeves!! I love Sleeves so much. 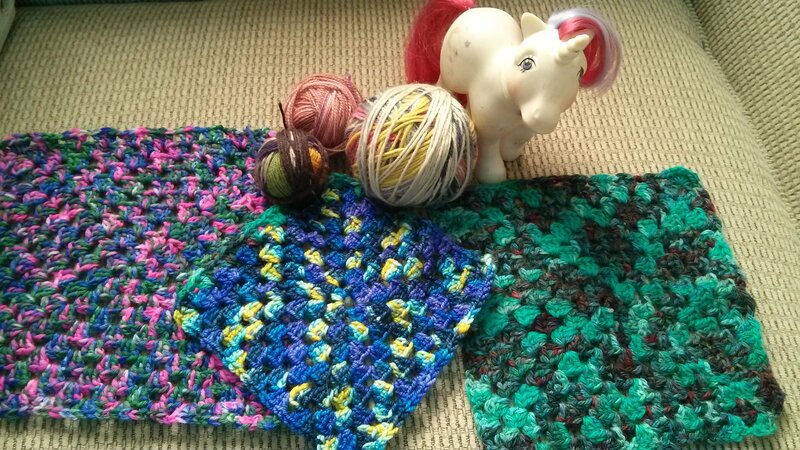 I have a lot of the yarn left though, I only needed a bit of another ball. Maybe 5 yards is all? So I happily put it in the stash, for something sometime from now. I’m trying to finish my Blue Lagoon and restarted my Hearts scarf. I’m having a lot of fun with Hearts now that I have the hang of the loops. 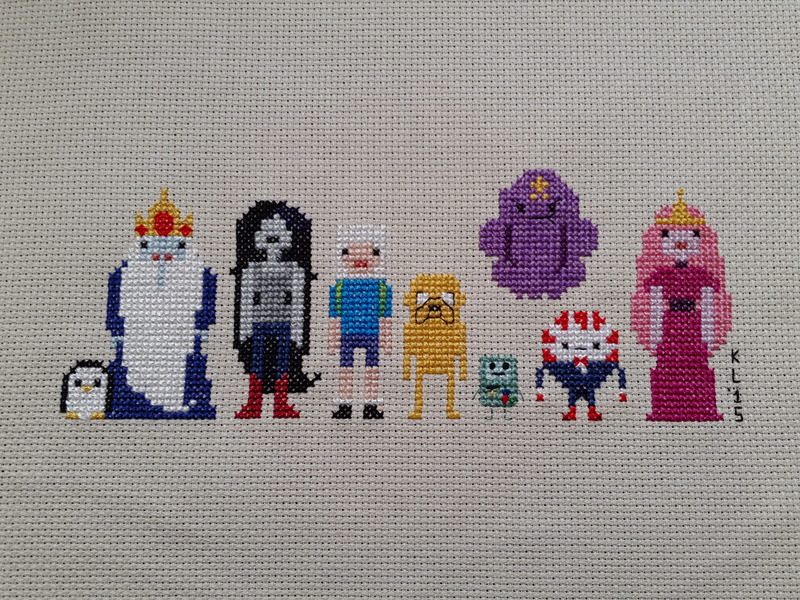 I got back into cross stitch lately, and am almost done with Adventure Time! woot! Can’t wait to finish it (ugh so much white in that beard) and give it to my buddy. He’ll love it! 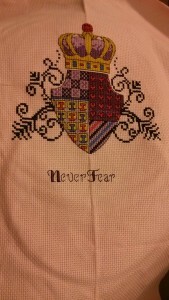 I haven’t blocked Sleeves or Cruella yet, so pictures will come later. 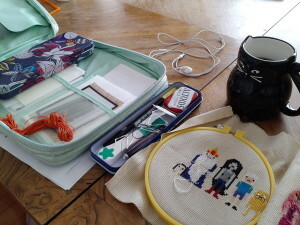 Until then, here is my current WIP, sooooo close to finished, and a super cute coffee cup. P.S. I finished while the pictures were loading! woohoo!